October 8, 2011 - The Transportation Security Administration (TSA) announced 29 airports which are set to receive recently purchased millimeter wave Advanced Imaging Technology (AIT) machines. The machines will be deployed with new automated target recognition software designed to enhance privacy by eliminating passenger-specific images while improving throughput capabilities and streamlining the checkpoint screening process. One technology used under the name "full-body scanner" is the millimeter wave scanner, the active form of which reflects extremely high frequency radio waves off the body to make an image on which one can see some types of objects hidden under the clothes. Passive millimeter wave screening devices rely on only the raw energy that is naturally emitted from the human body or objects concealed on the body; passive devices do not transmit millimeter waves. Another technology in use is the backscatter X-ray. 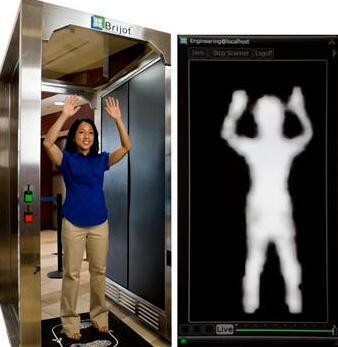 Two advantages of full-body scanners over a physical strip search are that it is quicker (takes only 15 seconds) and that people do not have to be touched in a manner that some might consider offensive unless the search is refused. A disadvantage is that the scanners are being used to perform routine, virtual strip searches without probable cause which opponents claim are illegal unreasonable searches that violate basic human rights. Furthermore, the true long-term health effects of the active, radiating technologies are unknown. Passive millimeter wave screening is marketed as safe because its technology does not require radiating the subject with specific wavelengths. ?We remain committed to implementing technologies that strengthen passenger privacy while ensuring the highest level of security,? said TSA Administrator John S. Pistole. ?In addition to improving the passenger experience at the checkpoint, advanced imaging technology continues to give us the greatest opportunity to detect and deter evolving threats to aviation.? TSA will make additional airport announcements as plans are finalized. Many factors are taken into consideration before AIT units are deployed including airport readiness and checkpoint infrastructure. AIT is designed to enhance security by safely screening passengers for metallic and non-metallic threats?including weapons, explosives and other objects concealed under layers of clothing. Imaging technology screening is safe for all travelers, and the technology meets all known national and international health and safety standards. In fact, the energy emitted by millimeter wave technology is 1000 times less than the international limits and guidelines. In September 2011, TSA purchased 300 millimeter wave units, which are being deployed in the coming months. Currently, there are nearly 500 AIT units at 78 airports nationwide. President Obama?s fiscal 2011 budget included the purchase of 500 units, and the President?s fiscal 2012 budget requests funding for an additional 275 units.